Domaine des 3 Cellier is like many of the best estates in the Southern Rhone, a family affair. In fact, Domaine de Cellier takes its name from the three brothers running the estate, Ludovic Celliers, Julien Celliers and Benoit Celliers. However, while Domaine des 3 Cellier is a new estate in Chateauneuf du Pape, (Their debut vintage was in 2007) the Celliers family has been active in making wine for 8 generations! Domaine des 3 Cellier was born when another Chateauneuf du Pape was split up, Domaine Saint Benoit in 2007. Domaine Saint Benoit was split into two parts with 50% of the property going into Domaine l’Or de Line and the remaining portion was used to create Domaine des 3 Cellier. Domaine des 3 Cellier owns 13.4 hectares of vines in the Chateauneuf du Pape appellation. The vineyards are farmed with an aim to completely embrace sustainable farming techniques. On average, the vines are close to 45 years of age. Their vineyards are planted to 68% Grenache, 11% Mourvedre, 7% Syrah, 4% Clairette, 3% Counoise, 3% Terret Noir, and 2% Vaccarese for the red wines. For the grapes used to produce their white wine, the vineyards are planted to 100% Roussanne. The best vintages of Domaine des 3 Cellier are: 2018, 2017, 2016, 2015, 2012, 2010, 2009 and 2007. Domaine des 3 Cellier produces 4 red Chateauneuf du Pape wines and one white Chateauneuf du Pape wine. Domaine des 3 Cellier Alchimie which is made from blend of 74% Grenache, 16% Syrah, 5% Vaccarese and 5% Counoise. The diverse terroir has rocks, stones, limestone, sand and clay soils. The vines are placed in the le Bois de la Ville, les Brusquieres, Palestor and les Terres Blanches lieux-dits. The wine is aged for 10 months in foudres. In most vintages, the production is close to 1,200 cases per year. Domaine des 3 Cellier Marceau is made from a blend of 35% Grenache, 30% Syrah, 17.5% Vaccarese, 15% Mourvedre and 2.5% Terret Noir. The terroir is mostly galets with clay soil in the les Terres Blanches vineyard. The wine is aged in 45% new, French oak barrels and demi-muids for 18 months. The production is small, with only 250 cases per vintage being produced. Domaine des 3 Cellier Eternelle is made from 100% Grenache in the sandy soils found in their parcels in the la Gardiole vineyard. The wine is aged in vats. Domaine des 3 Cellier Privilege is made a blend of 40% Grenache, 20% Syrah, 20% Mourvedre and 20% Vaccarese. The production is small, with only 250 cases per vintage being produced. Domaine des 3 Cellier Chateauneuf du Pape Blanc, L’Insolente is produced from 100% Roussanne. Try finding any as only 100 cases of this are made each vintage. Domaine des 3 Cellier can be enjoyed on the young side. Young vintages can be popped and poured, or decanted for an hour so. This allows the wine to soften and open its perfume. Older vintages might need very little decanting, just enough to remove the sediment. Domaine des 3 Cellier is usually better with 2-5 years of bottle age. Of course that can vary slightly, depending on the vintage. In the best vintages the wine should be consumed within 8-12 years after the vintage. Domaine des 3 Cellier is best served at 15.5 degrees Celsius, 60 degrees Fahrenheit. The cool, almost cellar temperature gives the wine more freshness and lift. Domaine des 3 Cellier Rouge is best served with all types of classic meat dishes, veal, pork, beef, lamb, duck, game, roast chicken, roasted, braised and stewed dishes, sausage, eggplant, tomatoes and cassoulet. Domaine des 3 Cellier is also good with Asian dishes, hearty fish courses like tuna, mushrooms and pasta. The white wine of Domaine des 3 Cellier is best served with a myriad of different seafood dishes, shellfish, crab, lobster, sushi, sashimi, chicken, pork and veal, as well as Asian cuisine. This is elegant, soft, silky, floral and fresh. The dark red fruits are ripe, juicy and sweet. There is length, complexity and a polish to the tannins you can feel in the luscious, dark cherry finish. The wine is produced using 100% old vine Grenache. Powerful, smoky, stony and concentrated, the wine is loaded with dark fruits, fleshy textures, black pepper and freshness. On the back end, there is licorice, spice and a serious depth of flavor with dark cherries and kirsch that does not quit. The wine should age quite well. The wine is made from a blend of 60% Syrah, 30% Grenache and 10% Mourvedre. Medium bodied, forward, fruity and already in the right place to taste, the sweetness in the red fruits, concentration and soft textures make this perfect for vivacious, youthful drinking. The wine is made using 60% Grenache and various other, assorted grape varieties. Juicy dark, red berries leaf, spice, pepper and herbal notes combine to produce a forward, earthy, garrigue tinged, peppery, full, rich wine. The wine is made from 50% Mourvedre, 30% Grenache and other assorted grape varieties. A step up from their other 2 wines, there is richness, depth of flavor and round supple textures. Dark cherry and earthy tones, with Provencal herbs are your treat in the finish. 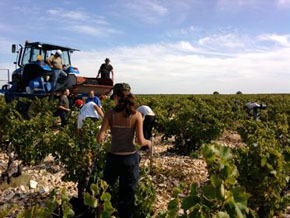 The wine is produced using 100% old vine Grenache. Medium bodied, forward and soft, with an easy to understand and equally easy to like character. The wine leaves you with soft, spicy, sweet red berries in the finish. Herbal, leafy aromas with a mint note that stands out, along with the thyme and earthy, spiced, red fruits. Medium bodied, soft, forward and ready to go, this will be ready on release. Fresh, sweet, bright, peppery, spicy kirsch and garrigue pop right away. Medium bodied, and produced in a lighter, forward style for tasty, early drinking. Medium bodied, herb tinged red fruits, soft textures and a forward character create an early drinking, kirsch filled charmer. Modern in style, with some oak showing in the nose, the wine is polished, with a fresh, red berry and thyme focus. Spicy, with black pepper and red berry notes, the wine is forward, yet, holds some of its spicy fruits in reserve. The wine was made from a blend of 35% Grenache, 35% Mourvedre, 20% Syrah and 10% Vaccarese. Light, easy drinking, cherry dominated wine for early consumption. The wine was made from a blend of 60% Grenache, 16% Syrah, 10% Mourvedre and 14% other varieties. Fennel, dark red berries, spice and earthy notes kick off the wine. Tannic, rustic and stylish, give it a few years to develop. With a floral, spice and jammy black raspberry the nose, the medium bodied wine ends up delivering sweet, round, spicy, kirsch notes in the finish.